Strategically positioned between East and West, Rhodes was one of the first Greek islands to engage in the cultivation of grapes. A plethora of archaeological finds and historical artifacts attests to the importance of Rhodian amphorae in transporting wine from the island and tells us that these were distinguished from others by an engraving of a rose (rodo in Greek) or Helios, the sun god. This was a form of branding, confirming that the wine was made from Rhodian grapes, and a precursor of the Appellation of Origin system that was established centuries later in Europe. Helped by its strong maritime presence, Rhodes was the biggest wine exporter in the broader region as far back as the seventh century BC. The first reference we have for Rhodian wine comes from the great Attic orator Aeschines, an opponent of Demosthenes, who was exiled to Rhodes in 330 BC. In a letter bearing his name, he says that he stayed in a small house with a garden in the area of Kameiros and that his friends treated him to olive oil, honey and a wonderful wine that was far superior to that of Athens. Rhodian wine went from strength to strength until the Knights of St John occupied the island in the early 14th century, while the 1522 conquest by the Ottoman army of Suleiman the Magnificent signaled the start of a very difficult period in grape cultivation that only really ended when the Italians took control of the island in 1912. Mt Attavyros that reaches to 1215 m high is Rhodes’ grape-growing heartland, a beautiful, Natura 2000-protected area, with verdant valleys, pine forests and a forest of cypresses in Embonas that is a designated natural monument. The best vines grow on its hills at an altitude of 650-700 meters. The vineyards are low-yield and exposed to the Aegean’s strong northerly winds, which, however, moderate the high temperatures and provide a favorable climate for high-quality grapes. The island’s main varieties are Athiri and Amorgiano, together with two Muscats, the petits grains (small-berried) and the di Trani, a clone of Puglia Muscat introduced by the Italians. 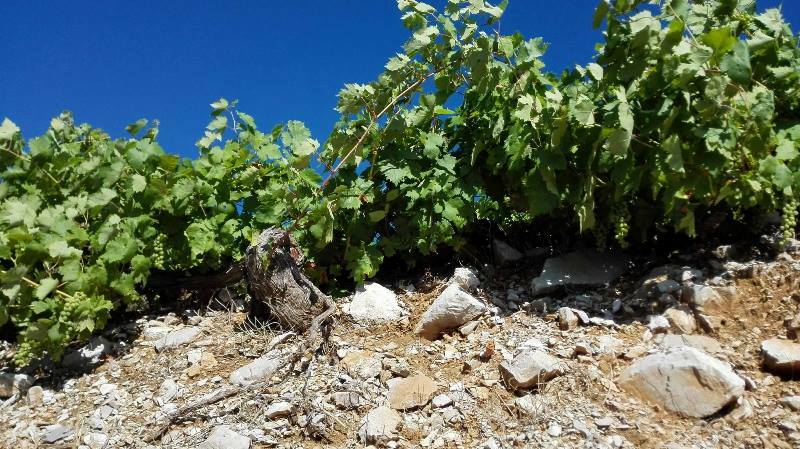 In the limestone-rich soil of Attavyros, there are Athiri vines over 70 years old growing on their own roots rather than American – resistant to phylloxera - rootstocks, as the spread of the pest in the Dodecanese stopped in Kos and never reached Rhodes. The wines made from old Athiri vines are like a completely different variety as they stand the passage of time well, acquiring a more concentrated and layered character. Five years in the bottle often transforms them into smoky wines with an impressive mineral presence. As far as reds go, the dominant variety is Amorgiano, which is none other than a Mandilaria, named such because locals believe it came from the island of Amorgos. It traditionally gives rustic wines with aggressive tannins, an intense color and high acidity that are tough to enjoy when they are still young. This abundance means that it is often blended with other varieties to smooth the edges of its rugged nature. Rhodes has two protected designation of origin (PDO) wines. PDO Rhodes concerns white wines (with a minimum of 70 percent Athiri blended with Malagousia and Assyrtiko), rosés and reds (70 percent Mandilaria minimum with Mavrothiriko), while it has also included sparkling wines since 2011. The second PDO is Muscat of Rhodes, made from white Muscat Blanc and Muscat di Trani. Despite the abundance of native varieties, winemakers also cultivate international grapes, foremost among them the Grenache Rouge, whose high yields has resulted in problems with quality. Rhodes’ wine industry is intrinsically linked to the acronym CAIR (Compagnia Agricola Industriale Rodi), a winery established in 1928 by a group of Italian investors that was responsible not only for keeping grape cultivation alive, but also making Rhodes one of the few wine-producing areas in Greece whose vineyards expanded after World War II. The company came into the ownership of the Bodossakis group after the Dodecanese islands became part of the Greek state in 1947. In 1957, it was sold to the Dodecanese Association of Agricultural Cooperatives (EAS). CAIR became wildly popular as a sparkling wine producer, with its Velvet and Rose Reserve labels constituting impressive examples of complex sparkling wines. Before Greece’s burgeoning middle class discovered imported champagnes, every bottle of CAIR was a “cause for celebration” according to an old advert, and sales reached 1.5 million bottles a year. For several years now, the company has been also emphasizing on the production of still wines, such as the Rodos 2400, launched in 1992 to celebrate 2,400 years since the founding of the city of Rhodes. Rhodes’ big liquor producer is Emery, founded in 1923 as an alcohol production unit and named after Emery d’Amboise, the 41st Grand Master of the Knights of St John from 1503 to 1512. 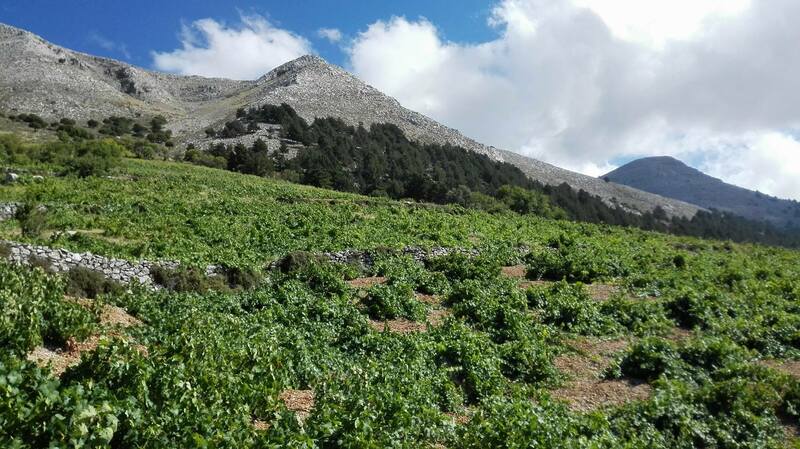 The company is now run by the third generation of the Triantafylloy family, producing wine since the mid-1960s and built its winery – one of the biggest in Greece – in 1974 in the village of Embonas, at an altitude of 700 meters. The vineyards, cultivated on the northwesterly slopes of Mt Attavyros, are renowned for the quality of their Athiri and Amorgiano grapes. There are, however, a few small artisanal wineries in Rhodes, such as the Alexandris Family Winery, which has been around since 1968 and is doing some very interesting things under the direction of third-generation winemaker Panayiotis Alexandris, a graduate of Montpellier’s famed university. The winery has around four hectares of vines producing just 20,000 bottles a year, with each label representing about 2,000 bottles. Aged examples of own -rooted Athiri from an altitude of 700 meters that mature for 11 months on the lees are like a punch to the stomach compared to what we know of this variety, with an intense smokiness and long lasting aftertaste. Besides Alexandris winery, there are few other wineries with interesting results such as Kounaki and Tatakis. The island’s lengthy history in winemaking and its potential for producing high-quality wines are givens. And even though Rhodes has not achieved yet the same success as other Greek islands like Santorini, Paros or Cephalonia, it is a outstanding wine tourism destination offering a plethora of exciting wines, both from indigenous and international varieties.